From riding match races as a teenager in the outreaches of Mexico to becoming one of the winning most riders in California with over 4400 winners and $64 million dollars in prize money, Bobby Gonzalez now owns and runs a layup facility in Brentwood, California. Bobby talked to us about his career. TBP: Bobby tell us about how you got involved with horses growing up. BG: I was raised in Michoacan, Mexico, my parents and grandparents had horses around the place where we lived and I always loved to ride. We came up to Tijuana in around 1968 as my father Sam Gonzalez started working as an exercise rider at Agua Caliente. 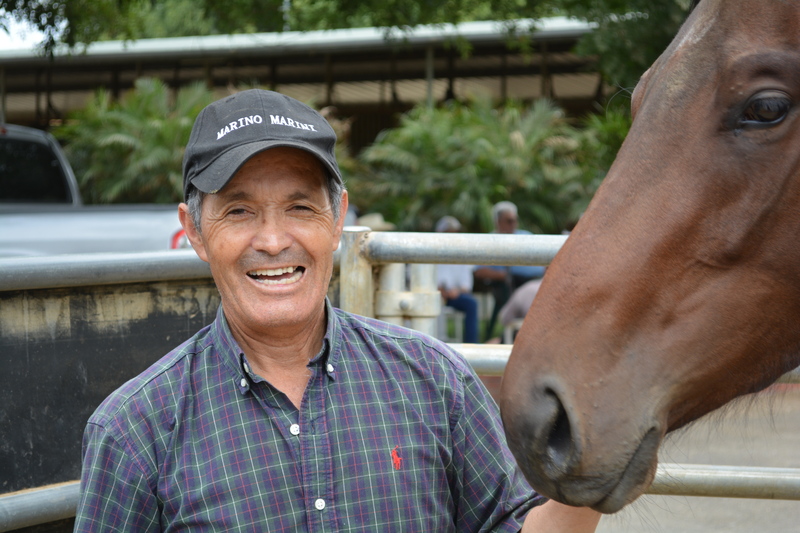 I used to go and watch him gallop horses at the racetrack there and that was my first experience of a real racetrack, although I had already ridden many match races in other parts of Mexico by then. TBP: Tell us about the match racing, was it legal or recognized as rules horse racing? BG: It was legal, but no it was not recognized officially. There would be ten to fifteen match races in an afternoon, just two horses going against each other over 200 or sometimes 300 or 350 yards, it was all about speed like quarter horse racing. Horse owners would challenge each other based on what they knew about each other’s horses, there were thoroughbreds, quarter horses and half breds and some horses would sometimes run more than once the same day. There was no tote system or bookmakers but there was big money being bet by people with each other. People also would bet on the stages in a race too, you could bet on which horse broke the fastest and was in front first jump out of the gate and there were cameras to record which horse was in front after 100 yards, 200 yards and 300 yards, so it was like having four races in one. TBP: So that experience may be part of the reason why you became such a great gate rider here in the states. After the match racing what was the next step for you? BG: I told my father that I wanted to be a jockey and I got a job at a thoroughbred ranch in San Clemente. They knew I had ridden in matches in Mexico so they asked me to ride match races here in California in Riverside county, which I did every weekend for a while. I worked at the ranch for three or four years and in ’71 I got a break when the trainer Jerry Dutton came to see some of his two year olds work. Jerry asked me to to go and work for him at Hollywood Park but I was scared to go to the racetrack at first and didn’t really want to go as I knew nobody there and spoke no English. Jerry kept telling me he wanted me to gallop his horses so eventually I went to work for him. I didn’t know what I was doing at first and I didn’t understand Jerry’s instructions either, I had to learn the Hollywood Park track by having one of the grooms draw me a map and then running round the track myself to see where the poles were. I worked for Jerry for two years and got my jockey’s licence in 1975 as a lot of people had been encouraging me to go for it. Tony Diaz who rode then and now trains was a big help to me. I had half a dozen rides and then rode my first winner on May 1st 1975 on a horse called Sawtoot. I was five lengths in front with a sixteenth to go and I was so excited I stood up four or five jumps before the wire. It was an allowance race worth $16,000 so it was a big score for me as working for Jerry I was making just $375 a month and I was on 10% of the winners share of the purse, so it was a big payday. TBP: After that first winner how long did you have to wait for the next? BG: Not too long, I rode three longshot winners at Hollywood Park just before Del Mar opened. Then on opening day at Del Mar I rode the winners of each leg of the daily double. After that I started getting a lot of attention and I think I was third leading rider of the meet. This entry was posted on Thursday, July 10th, 2014 at 1:39 pm and is filed under The Interviews. You can follow any responses to this entry through the RSS 2.0 feed. Both comments and pings are currently closed.